Committee chairman David Rossi calls Mr. D'Andrea to offer him the job. The all-Island school committee voted unanimously Wednesday night to name assistant superintendent Matthew D’Andrea as the next superintendent of Martha’s Vineyard Public Schools. The decision came after a 45-minute discussion that saw support for both Mr. D’Andrea and Oak Bluffs principal Richard Smith to be named to the top post, with the committee divided 8-5. 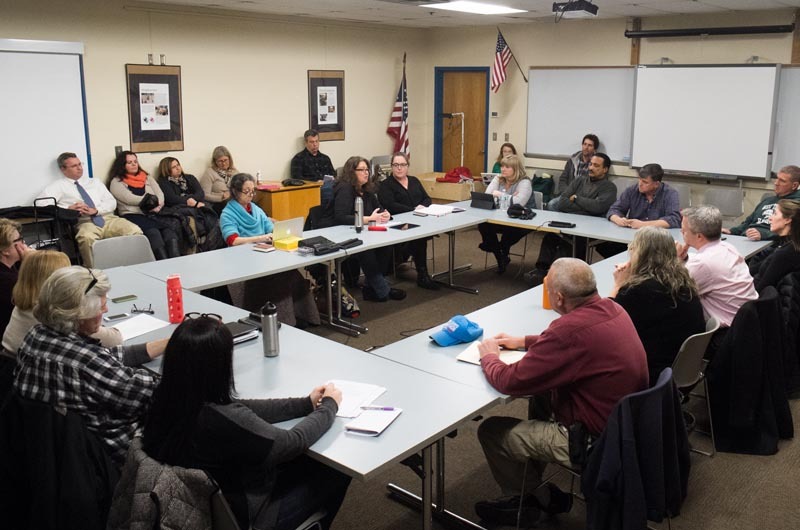 In the end, several school committee members emphasized Mr. D’Andrea’s experience, and the motion to name him superintendent was approved unanimously. Current superintendent Dr. James H. Weiss is retiring at the end of the school year after 10 years on the job. 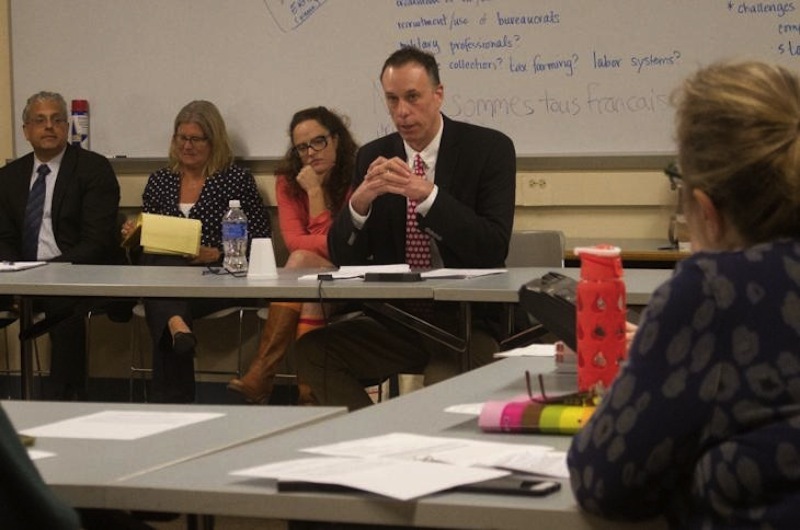 A search for his replacement began in the fall, with James Hardy of the Massachusetts Association of School Committees facilitating the process. A pool of 18 initial candidates was narrowed to a group of five, with Mr. D’Andrea and Mr. Smith emerging as finalists. Interviews with both finalists were conducted last week. Colleen McAndrews, who was also a member of the search committee, thanked Mr. Hardy for his help with the selection process, particularly his suggestion to look within the Vineyard school system for candidates. “I was thinking how lucky we are to have such strong internal candidates, and I still feel that way,” she said. “There really isn’t a bad decision here,” committee member Michael Marcus said. Each committee member spoke briefly about their initial choice for superintendent. Lisa Reagan abstained from the discussion and the vote. “I appreciate that Matt was honest in sharing his vision, which was very clear, as well as areas he’d like to work on changing,” Theresa Manning said, adding that the transition would be smooth because Mr. D’Andrea already works in the superintendent’s office. Mr. D’Andrea was named assistant superintendent in August 2013. He was previously principal of Old Hammondtown School in Mattapoisett and an assistant principal in Marion. “The person that you hire for this position has to understand this is a unique place, that the Island community prides itself on providing an education for the students that allows them to be who they are,” Mr. D’Andrea told the school committee last week during his interview. He said his areas of focus would include universal preschool and teacher retention. Several committee members pointed to Mr. D’Andrea’s time as interim principal of the regional high school last spring. “Matt dealt with some amazing things,” Mrs. McAndrews said. “Not only did he come into a situation here where the high school was kind of in disarray, he had to deal with some [other] staggering situations, like an AP exam that had gone awry . . . it really could have been detrimental to the kids. “To me it shows how a leader is truly going to handle situations. I was very impressed by that,” she said. Others praised Mr. Smith’s long service with Vineyard schools. Mr. Smith was assistant principal in Tisbury before becoming principal there. He was later chosen by Mr. Weiss to lead the Oak Bluffs School, which was on the verge of being labeled as failing under No Child Left Behind guidelines. Kris O’Brien said that Mr. Smith had successfully run two different schools on the Island, and demonstrated that he could work with town officials during budget season. “I joke that he waves a wizard wand and things happen, but it’s not, it’s his time and thought,” she said. Mr. Weiss attended the meeting but did not offer comment until after the vote. 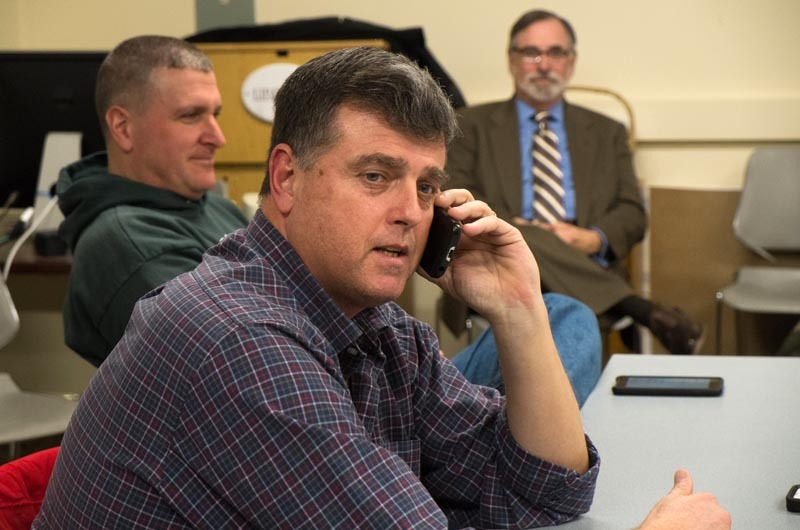 After the vote, all-Island school committee chairman David Rossi called Mr. D’Andrea to officially offer him the position. Reached for comment Wednesday night, Mr. D’Andrea told the Gazette that “it was an intense process, but it was very well done, very professional. “I’m just really overwhelmed, and I’m honored to have been chosen for the position,” he said. Mr. Smith told the Gazette Thursday that the process has been smooth, and he returned Mr. D’Andrea’s praise. “It was really well done,” he said. “Confidentiality was kept — Jim Hardy was very professional and very helpful. Everybody, the school committee members, the search committee, was accommodating and welcoming. Great choice! Congrats Matt! I am sure you and your family are very happy! Just as important as academics the structural deficiencies of all facilities need to be addressed. Just as critical as the overhaul of the hospital was to the community perhaps the building inspectors and health agents should be involved in bringing our educational facilities up to code.